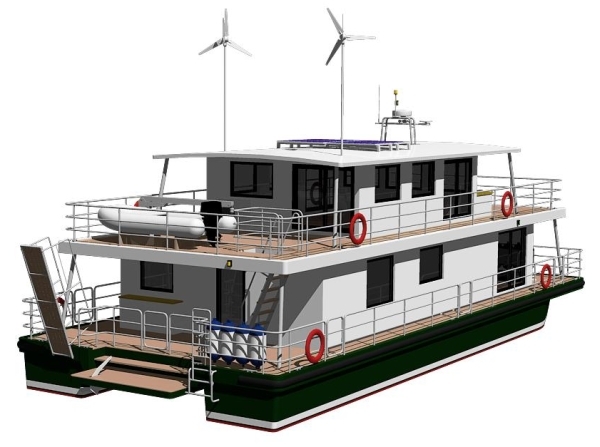 Of designs shown on the website Modus Maris houseboat, Respect River houseboat and Floating Café where created per customer requirements. In our opinion they are good samples of our style, way of thinking and quality. Now you can buy them as stock plans. Buying stock plans or contracting us to design a boat to your requirements mean that you buy rights to build one boat. The designs remain the property of Modus Maris Ltd. If you would like to build more than one boat just buy rights to build next boat before you start. So, what scenario could be if you choose us to design your houseboat or party boat or another pontoon boat? We are starting from studying your requirements: usage(1), sailing area, key dimensions (2), crew and passengers or guests, endurance, hulls and bridge-platform materials (3), propulsion (4), etc. (1) Pontoon boats usage are family houseboats, charter houseboats, ferry boats, sightseeing boats, party / barbecue boats, work boats, fishing boats etc. 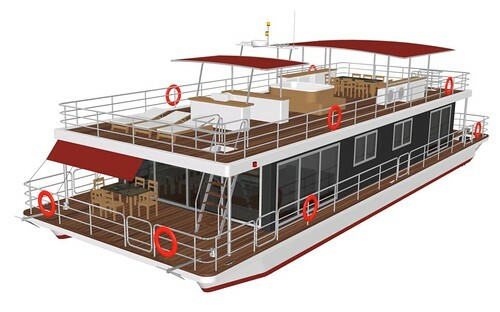 Non-self-propelled pontoon boats can be used as floating homes, offices, catering establishments, retail outlets etc. (2) Key dimensions are length, beam, draft, height over water for inland waters, etc. 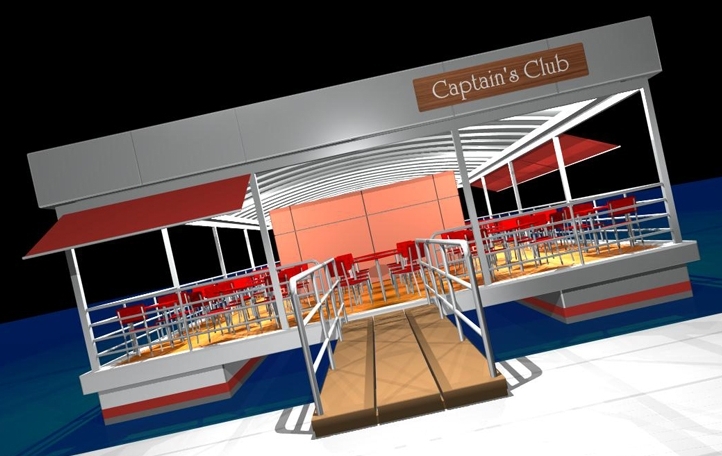 (3) Floating part of our boats, so called platform-catamaran, could be constructed in aluminum or steel, or combination of both such as hulls made of steel and bridge-platform made of aluminum. (4) Our boats could be equipped by normal diesel engines as well as hybrid engines, electric motors, outboards, etc. When our design task is clear for us we offer a straightforward agreement to sign. Generally this agreement repeats articles we talk about here. Apart from design documents which we supply, our design service includes unlimited support during construction via emails. 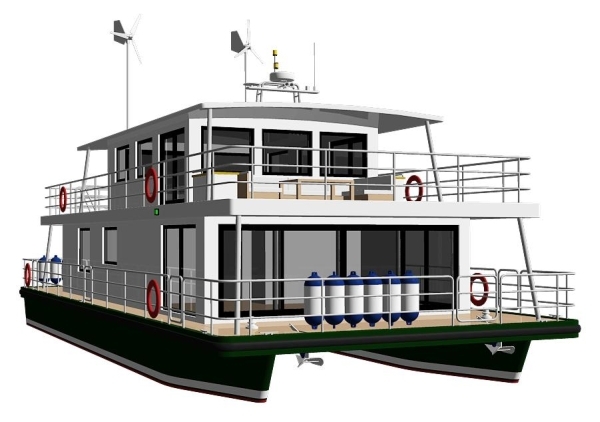 The design documents which we will prepare are outboard profile, interior outline and arrangement, deck plan, hull structure, platform structure, scantling section, initial weight study, specification, engine and other equipment arrangement. Our job will be done in 2 phases. In phase 1 we will prepare an outboard profile draft showing how the boat appears from the outside and arrangement drawing draft showing the interior layout if any together with preliminary specification and will discuss until a plan suitable to you will arrived at. Then, in phase 2, we will prepare design documents listed above. Phase 2 could be completed in 1-2 month time. Payment terms are as following. We would like to be paid in 3 installments. The first installment is 30% of the sum contracted and after receiving this initial payment we begin work on the project. After we complete the phase 1, we submit an invoice for the second installment which is also 30%. Upon completion of the project, we email image library and most of drawings in pdf and submit an invoice for the remaining amount of 40%. After receiving the final installment we email AutoCAD drawings and rest of drawings in pdf. Please contact us by email, phone or Skype to buy stock plans or contract our service. I am about to build my house boat on a tidal mud mooring, the sea floor isn’t level I’d place concrete blocks to level off the mud sea floor to hold the structure level whilst the tide is out. Would your pontoons cope with the loading of a home approx. 75 foot x 20 foot when the tide is out? Weight of boat would be difficult to calculate as I am a complete dilettante, I’m a first build houseboat virgin. Living/dining room, kitchen, 3 bedrooms, 2 bathrooms 1 office and hallway. Budget – for the base?? What about maintenance and longevity in salt water? I would like to build one pontoon style house boat on dimensions 5m x 20m long. I have limited budget and like to know if you can assist evaluationg what is possible. There are few contacts I have which can follow your drawings especially hulls and structure like made in China. Than cost might be lower butthe shipment I plan to have in modular prefabricaded solution to be shippen in container and than assemebeled at the final location in Europe. Your plans look very nice, please advise. of course it is possible prefabricate the boat in China and transport to EU in container. You are welcome to discuss the project in details. 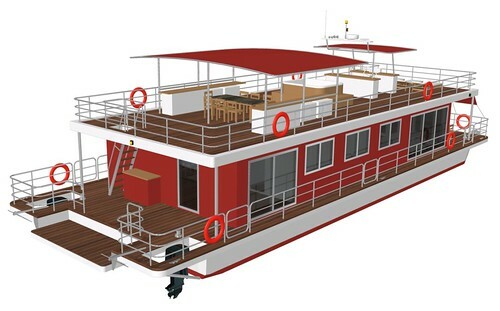 We are planning on building our own house boat, we really liked Mudos Maris design, but we are thinking to customize it according to our environment. let say plans will be 4000 euro. The price for per-fabricated houseboat depends a lot on your requirements and specification.